The 50T Weighbridge is available in variable lengths and widths, and is fully customizable to any customer requirement. 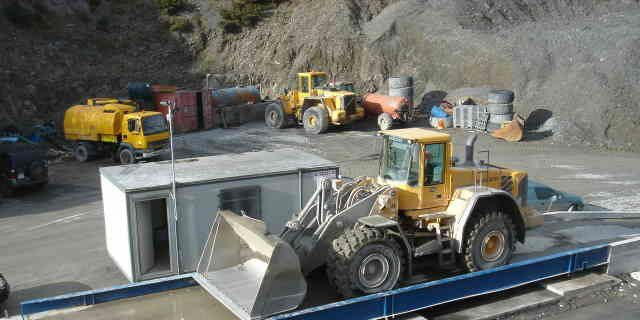 Standard weighbridges are 15.5mtr x 3.5mtr or 18.5mtr x 3.5mtr. The weighbridge is surface mounted unit with Steel / Concrete construction and uses only trade approved loadcells and digital weight indicators. Cost effective, due to reduced civil work requirements. Reduced costs, due to the fact that no crane or heavy lift equipment are required for set-up and installation. Extremely strong, hard wearing, low maintenance structure. Ease of cleaning, due to the ample ground clearance all round and Loadcell positioning. Reduced number of moving parts, due to high precision IP68, Loadcells and mounts. Self aligning, self buffering Loadcell mounts. Comprehensive earthing system to offer lightning/surge protection to Loadcells. Replacement Loadcells are readily available and can be sourced from multiple suppliers (Most of the weighbridge suppliers provide their own brand of Loadcell which are ONLY available from them). IP 68 junction box comes with built-in lightning/surge protection earth strap. Steel I-beams act as guide rails ensuring safe and correct vehicle positioning.